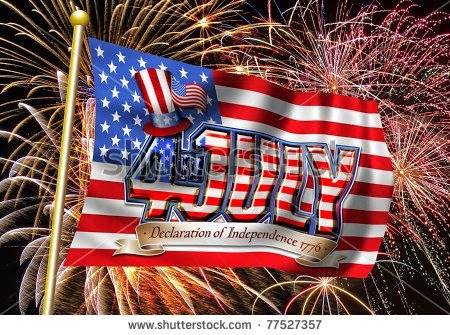 The Popcorn Factory 4th of July Celebration Giveaway! popcorn and snack packages for three lucky winners to enjoy. For more than 30 years, The Popcorn Factory has been the "popcorn authority" with their impressive collection of crowd-pleasing gifts and great-tasting snacks. They start with the finest corn grown right here in the USA and transform each kernel into premium popcorn using 100% corn oil and infusions of the very tastiest flavors. The Popcorn Factory pops over 1 million pounds of popcorn per year, and all of our popcorn is Kosher OU-D. They'll see stars, but in a good way, when you send one of these impressive Patriotic design Tin & Tower options. Both hold enough snacks to thrill the guests at any summer party, starting with a 2 gallon tin of our delicious premium popcorn (Butter, Cheese and Caramel) and joined by chocolate double twist caramels, foil-wrapped chocolate stars, chocolate chip cookies, 4 sweet-coated gourmet pretzels sprinkled with red, white and blue nonpareils and patriotic Jelly Belly® beans, all tied pretty with red ribbon. Add a spectacular 7th tier Nut Quartet (honey roast & spicy peanuts, mixed nuts and natural pistachios) and a custom gift tag and make your gift even more special! 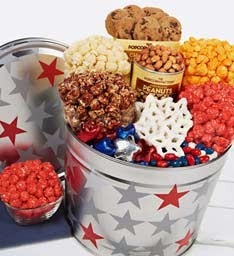 Packed inside our sleek star-spangled tin is a dazzling assortment of delightful treats! Savor our gourmet Cinnamon Popcorn, Cheese Popcorn, White Cheddar Popcorn and Chocolate Popcorn; Chocolate Chip Cookies, Honey Roast Peanuts, Star-Shape Confectioner Pretzels, Red White & Blue Jelly Belly® Beans and foil-wrapped Chocolate Stars. A welcome hostess or “thank you” gift for all ages. 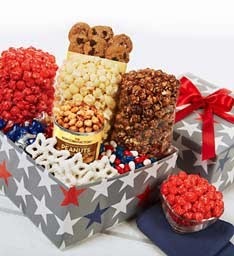 Make every summer gathering a blast with our Patriotic Sampler, filled with fresh treats and gourmet flavors! 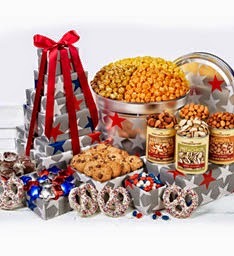 Gourmet Cinnamon Popcorn, Chocolate Popcorn, White Cheddar Popcorn, Chocolate Chip Cookies, Dry Roast Peanuts, Star-Shape Confectioner Pretzels, Red White & Blue Jelly Belly® Beans and foil-wrapped Chocolate Stars fill our star-patterned box to the brim. It’s a gift your summer hostess will never forget. 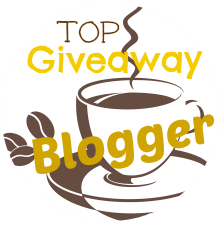 This giveaway will end at 12:00 Am (EST) 7/04/2014. for awarding and shipping the prizes directly to the winners.